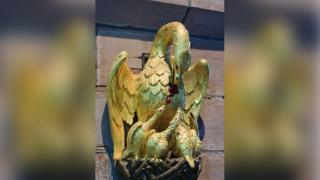 A 252-year-old statue of a pelican has been stolen from a church. The ancient wood carving, which dates from 1766, has hung in St Dyfnog Church in Llanrhaeadr, Denbighshire, for more than a century. However the 2ft (0.6m) gilded statue was stolen at some point between 22 August and 5 September. Vicar of St Dyfnog, the Reverend Val Rowlands, said: "The church community is saddened to learn the carved wooden pelican is missing." The gilded pelican was copied from the bird that appears in a panel of the church's famous Jesse window, that was completed in 1533. Mrs Rowlands added: "In Christian art, the image of a pelican feeding her young from her own blood, symbolises the sacrifice Christ made by dying on the cross. "We hope the carving will be returned soon so the local community, as well as the many visitors and pilgrims to the church, can once again appreciate its importance, beauty and significance to St Dyfnog's."